Bio: The youngsters say that Leo can't be killed and the old mobsters say he'll never die; they're both right in some respects. 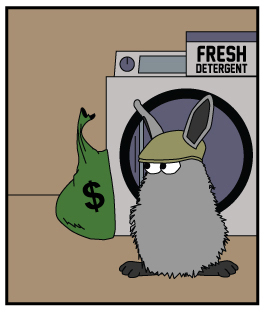 Leo is a sign of longevity in the Dust Bunny Mafia. He's got both the years and the battle wounds to prove it. He may be small but he's still got plenty of fight in him, which is another reason that he's made it to the top. Well that and some good financial backing; which he has Benny to thank for that. View all of Leo's appearances. 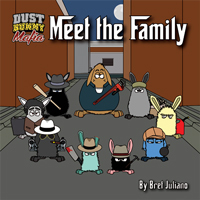 Bio: Jimmy's the front man of the Dust Bunny Mafia. So why do they call him the nose? Because you've got to be pretty tight-lipped around someone like him. 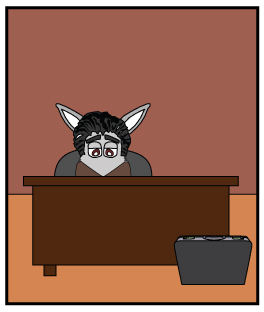 If he's around, he's gathering information to report back to the boss. If he's not around, youâ€™d better be sure that heâ€™s not listening because if he gets wind of anything, the secret is out. And you better be pretty smart about it if you get the guts to try to keep Jimmy quiet, he may be small but Frankie's not and you can bet if Jimmy gets hurt Frankie will be coming for you. View all of Jimmy's appearances. 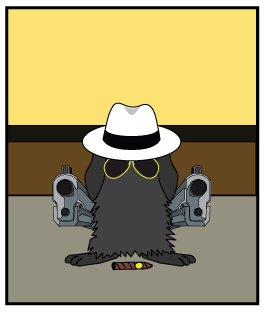 Bio: In this day and age, everyone's got to have protection and Vinnie's the best, which is why the Dust Bunny Mafia bought him, literally. Vinnie has been around the game for years, even before he was hired by the D.B.M. and as the times have changed, Vinnie has been there on the frontlines watching it happen. 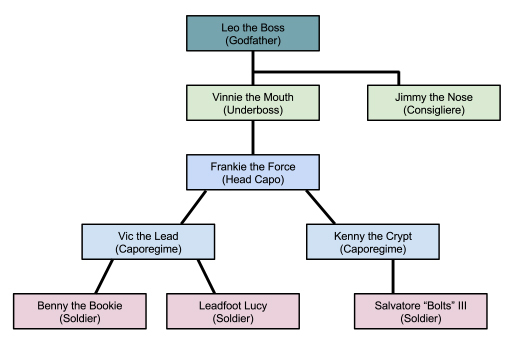 With all that knowledge that heâ€™s stored up itâ€™s easy to see why Vinnie has a lot of enemies. But thatâ€™s okay; Vinnie's not too worried anymore because when heâ€™s out on the street heâ€™s got Vic the Lead to cover his back. The scariest duo of the Dust Bunny Mafia is Vinnie and Vic because Vinnie will serve you up and then Vic will go to work on you. View all of Vinnie's appearances. 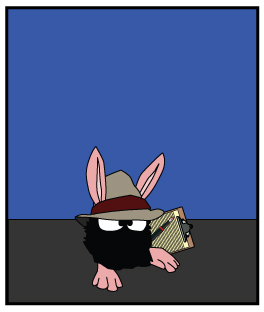 Bio: Frankie the Force is the muscle behind the Dust Bunny Mafia. Boy he's got a temper and it wasn't long after Leo met Frankie that he realized his potential. This is where Frankie transitioned from taking his aggression out on walls and punching bags to punching scumbags and putting his enemies through walls. You'll often see Frankie and Jimmy together and thatâ€™s one duo not to mess with. Between Frankie's force and Jimmy's nose whatever you did to get on their bad side will be spread all over town before the time that you come to. View all of Frankie's appearances. 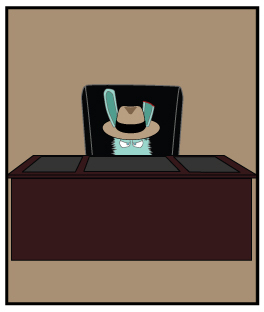 Bio: Vic is the ace in the hole of the Dust Bunny Mafia. Vic is the guy that gets the job done. Vic the lead is the silent killer. Raised by ninjas, lived with monks and then was trained by the Special Forces you'd be pretty stupid to mess with Vic. With deadly precision Vic will take you out without a second thought. Vic and Vinnie team up a lot out on the streets; there are a lot of characters out there that don't like listening to what the Mouth has to say. In those cases Vic is the silent partner, with his gun drawn, Vic can be pretty persuasive to anyone. View all of Vic's appearances. Bio: Kenny's computer experience goes back to the day he was born, born inside a computer. His parents were a famous duo of computer dust bunnies. When they weren't cracking government security systems virtually, they were jumping inside computer fans to dust them up and bring the systems down. When you grow up inside a computer, you get plenty of time to learn the ropes. Kenny is no exception, he's mastered the art of multi-tasking and technical support and is constantly seen playing Tetris and drinking coffee. 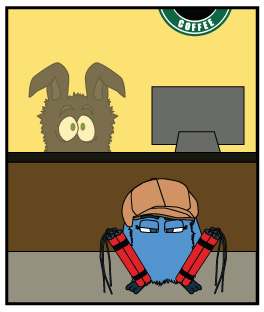 It's a wonder how he can work for the Dust Bunny Mafia and a coffee company, but we never see him actually working. View all of Kenny's appearances. 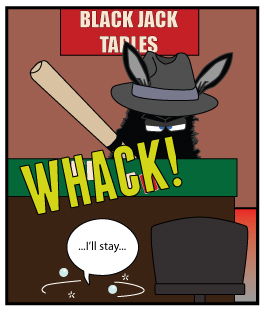 Bio: Benny the Bookie is the numbers runner of the Dust Bunny Mafia. Without Benny running the books behind the scenes the D.B.M. wouldnâ€™t be as powerful as they are today. With a tight lip, a rich family, a strong background in finances and dedication to family values, Benny was the perfect fit. And it just so happened that a position opened up for him after Leo caught Dino, taking more than his fair share. Last time anyone ever saw poor Dino was when Vic, Frankie and him were going to take a drive. It's a good thing that Benny knows what’s good for him. View all of Benny's appearances. Bio: From the day that Luciana could reach the pedal, she knew she wanted to live a fast life. From her first job as a package runner for the Crows, Lucy knew that driving would be the key she needed to live the fast life she'd always dreamed of and with a beater of a car in her possession, freedom was finally at her ear-tips. Now that Lucy has teamed up with the Dust Bunny Mafia, she's become the official get-away-driver. 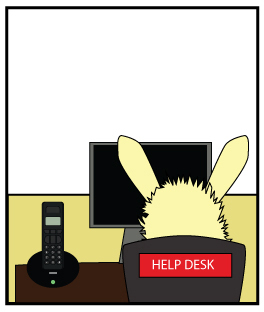 Just in case the dust bunnies get in too over their ears, she's got the Crows on speed-dial, and for her, they are ready and willing to give her a lift any time she needs. View all of Lucy's appearances. Bio: Salvatore didn't spend all his life trying to be a mechanic, it just sort of fell into his lap, well, that’s not entirely true but that's what people think happen. The truth is Salvatore used to be a professional eater. 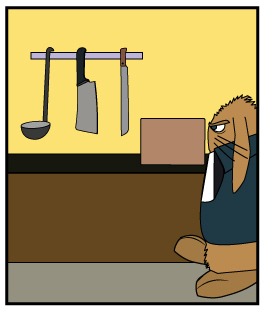 Everything was going well there until he was banned from certain restaurants. You see, Sal got to be so big that most chairs at the restaurants couldn't support his weight, so he’d break them, all of them and since it was his job to eat, not fix things, he often left places with stacks of empty plates and broken chairs. It didn't take long for it to catch up to him and he had his position revoked until he repaired all of the chairs he broke. So Sal picked up some bolts and his life was changed. Now Sal holds the position of the DBM’s only mechanic and spends his off time, break time, meal times ¦and well actually he spends just about all the time eating, and occasionally fixing things. View all of Sal's appearances. Paul “Steel Toes” Della and his associates. Affiliation: Enemies of the Dust Bunny Mafia; mutually hated by the Crows. Paul “Steel Toes” Della and his family run the gambit of gambling in the country of Espresso. 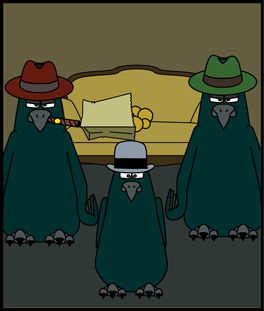 Presently at odds with the Dust Bunny Mafia crew, it wasn’t always that way. Back in the day, Paul and Leo were thick as thieves… but, as fate would have it, in a messy incident, Paul cut off the top of Leo’s ear and Leo reciprocated by cutting off Paul’s ties. 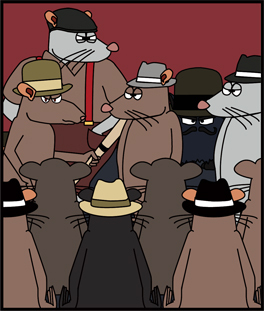 Ever since that day, the lines were drawn as the rats and the dust bunnies became mortal enemies. View all of the Rats' appearances. Floyd, Fred and Francis, the crow brothers despise rats, unless they come properly prepared: dead, raw to be exact. Together, are cold, calculated and murderous competition. Their main form of criminality is money laundering. They are the go-to crew in Fairview for getting blood money cleaned. As much as they dislike the rats, they aren’t above working for them, because at the end of the day, it’s all about the money for these crooked birds. View all of Crows' appearances. The police department has long been in the business of keeping the criminals of Fairview at bay. This small unit consists of Detective Mickie Potatoes and officer Tommy S. Gunn. Mickie Potatoes is a quick-witted, pigeon with a background in boxing whose main ambition is to live up to his father’s legacy of putting the heavy-hitting mafia families in jail. 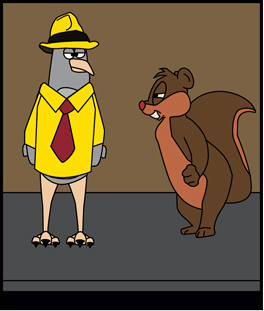 Tommy S. Gunn is an impulsive squirrel with a short fuse and a shorter appetite. They say that Mickie’s in the game for the justice, well Tommy is in it for the donuts.